Meola Creek has a new good neighbour. A local resident has improved his yard and helped our creek and harbour by using ‘gobi blocks’ instead of concrete as a pad for his car. This is rare at a time when concrete trucks abound as gardens are covered over. Upper Meola Creek has dozens of overflows each year causing sewage and toxins from roads and roofs to spill on to land, and into Waitemata harbour. At the same time the base flow is lowering because the water is all being channelled to the sea, instead of naturally filtering and recharging the aquifer. We have the information and the technology to reduce the concrete covering our back yards and driveways. 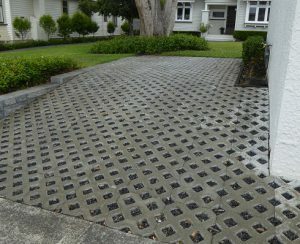 We look forward to Auckland Council and CCOs showing the way with permeable road and foot path surfaces, to reduce the detritus from roads which currently flows into our creeks and harbours.